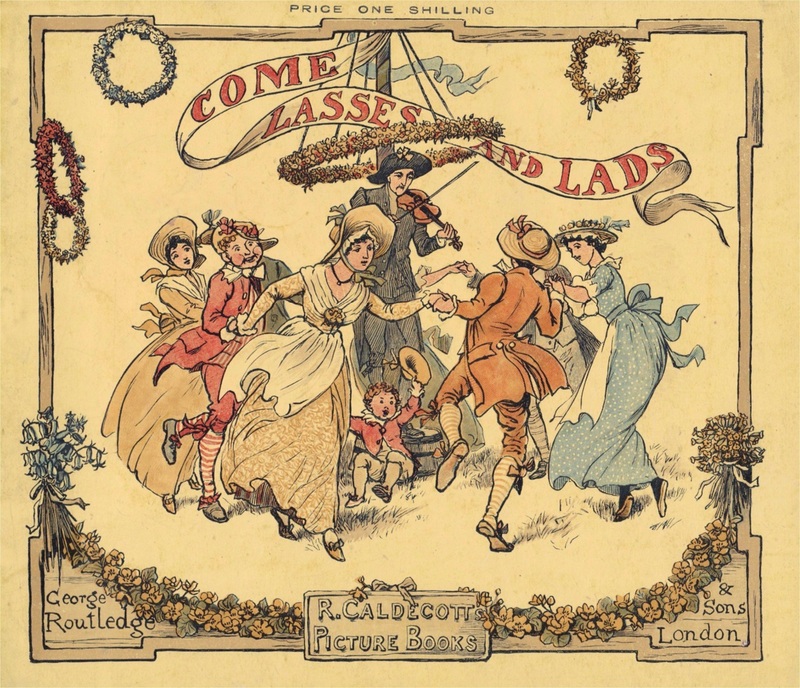 Randolph Caldecott's 'Come Lasses and Lads' (1884) depicts a traditional maypole. Dancers encircled the pole, but there were no ribbons for them to entwine. 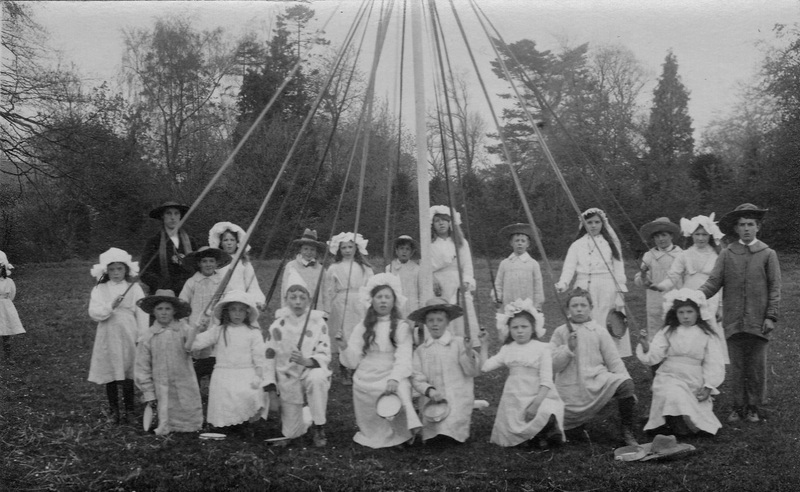 Maypole in the village of Bucknell, May Day 1918. Ribboned poles were now the norm. 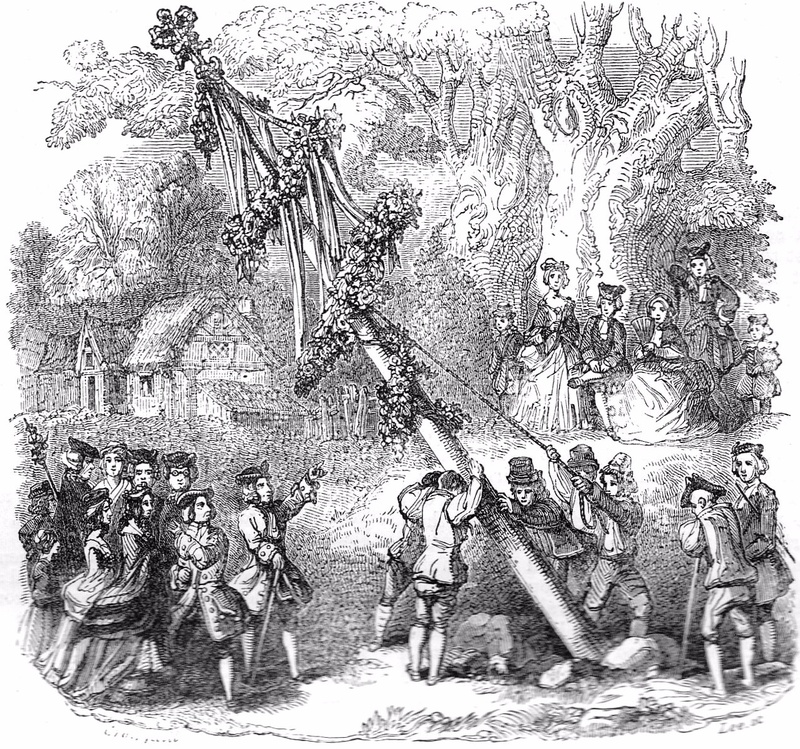 Garlanded maypole in a 17th-century print. 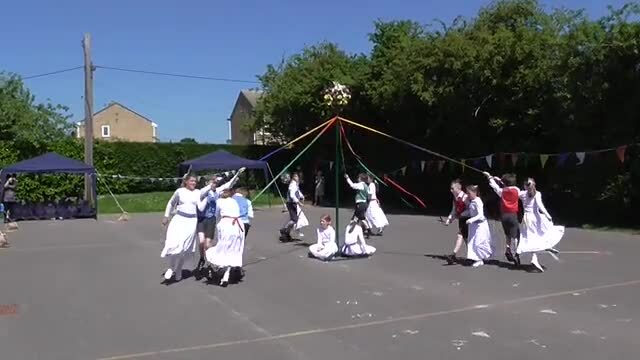 The first recorded evidence of maypole dancing in Britain dates back to 1350 when it appears that a tall birch pole was erected at Llanidloes in central Wales. Traditional maypoles were rough-cut trunks of any tall, straight tree such as birch, pine or ash, bound with leaves, flowers and ribbons. People simply did a dance around around them, sometimes holding hands, sometimes kissing in passing. More elaborate poles might be painted and topped by garlands, but no-one held ribbons in the early days. Music was typically supplied by a man playing a pipe and tabor, as in the picture to the right. Alternatively a bagpiper might play for the dancers, and a fiddler is often depicted in later centuries. 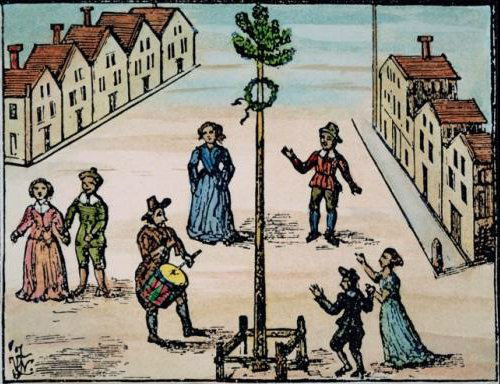 In 1661, after the monarchy had been restored, a huge maypole was erected in the Strand in London, reaching over a hundred and thirty feet. Obviously this was exceptional; a common length for a Maypole was about 30 feet. In 1672, at Stanton St John in Oxfordshire, some young men cut down a tree without permission. It was 31 or 32 feet long and 1 foot across. They had to pay 30s. for it. 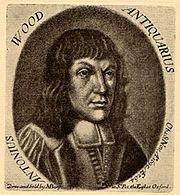 Diarist Anthony Wood (1632-95). He also styled himself Anthony à Wood. People used to play April Fool tricks on May Morning. Anthony Wood, the great diarist of 17th-century Oxford, refers more than once to ‘may games’ as practical jokes. Wood’s writing also indicates that a Maypole might be set up by a householder as a may game – especially to wind up the local Puritans. For the summer of 1641 Wood reports that ‘a most licentious and profane fellow’ in the parish of Holywell set up a Maypole and fixed to it the picture of a Roundhead, specifically a Puritan steward of one of the Oxford colleges. With his companions, ‘making themselves mad-merry about it’, they brought muskets and other weapons to shoot at the effigy. My Bird is a Round-head is the title of a broadside ballad of 1643. 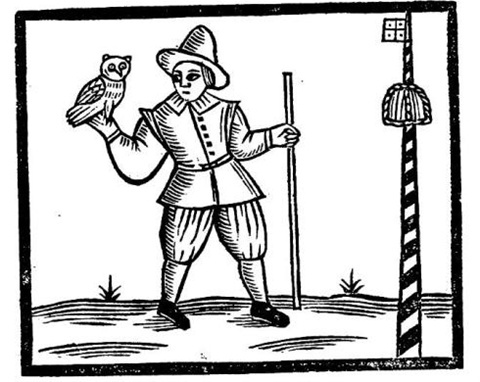 It was written by Humphrey Crouch and tells the true story of a Northamptonshire man who set up a maypole and kept a tame owl that he called Roundhead. One of his Puritan neighbours had him brought before a Justice of the Peace for these provocations. The conventicles were small assemblies of non-conformist lay people who, denying the authority of the Anglican Church, would hold their own services wherever they liked, often out of doors. It is interesting that giving the Tingewick girls a maypole was seen as a way of binding them to the older established religion. So too, the Newington men were allowed a maypole - if it was later fashioned into a church ladder. Here is further evidence of the covert understanding between May revellers and the local parish church. Maypoles with ribbons were increasingly seen in later decades, but were by no means universal. 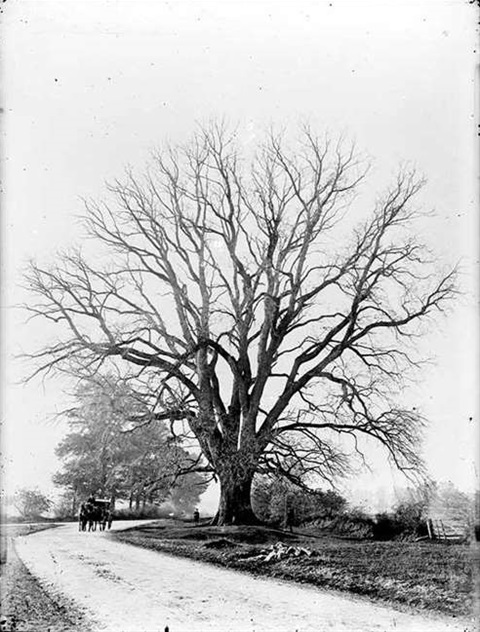 The ribboned pole was standardised by John Ruskin. He introduced the practice in 1881 at Whitelands College, a teacher’s training college for women, situated in Chelsea. The dancing formed part of an elaborate May Pageant, with the crowning of a May Queen (see The May Queen above). From Whitelands, women teachers took the new tradition wherever they went, and it quickly became standard in schools. 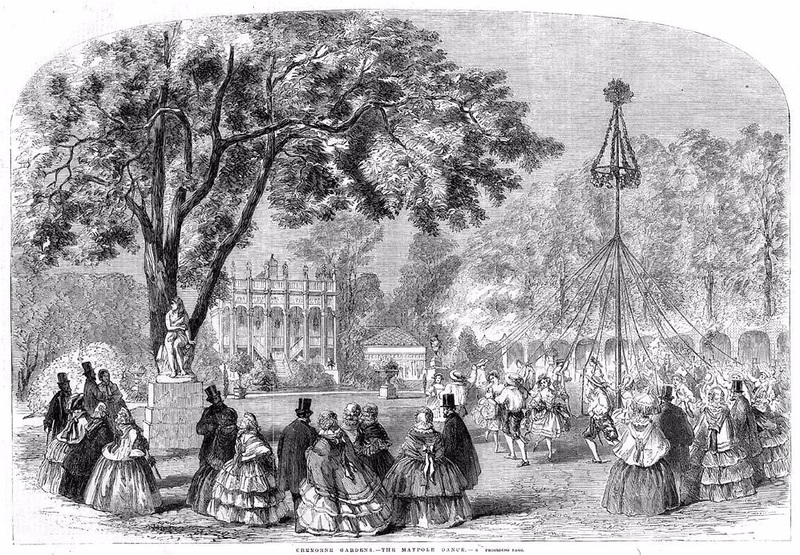 Ribboned Maypole at the Cremorne Gardens, London, in 1858. By this time the ribbon dance is starting to catch on but it is not yet universal. This is a formal entertainment staged by the proprietor, Mr T Simpson. The dancers are in all likelihood professionals wearing 'rustic' costume. And it's not May - the picture comes from the Illustrated London News, 14 August 1858.